Lucky, a blue Zafara, thought she was just that. She wasn't extremely intelligent or very good at the Battledome, but she was optimistic about herself. She wasn't painted, nor was her species very rare, but she led a decent life. Her owner, although not particularly wealthy, logged on NeoPets almost every day to care for her and her older brother, Dantus. Dantus, a red Grarrl, was a good brother and friend to Lucky, but he annoyed to her sometimes, the way older brothers do. Lucky wore an amulet around her neck that, her owner once said, would bring her luck, and thus called her "Lucky." The charm seemed to work, and life got along pretty smoothly until it hit a bump. One morning, Lucky was eating NeoCrunch cereal in the kitchen when her owner walked in. It was a shining new morning, and light streamed in from the window and illuminated the blue kitchen. "Lucky, I've got great news!" Lucky's owner exclaimed. Her owner grinned and replied, "I was accepted into a college!" "College?" Lucky queried. She'd never heard of it. "What is it?" "It's like a Neoschool, only in my world. You have to go to it for a few years -- it's usually four -- to get a high-paying job in my world. But you have to study at school for years before you can even apply for one." "That sounds neat," she commented, proud that her owner was happy. "Yeah, it is." But her owner stopped and looked at the marble floor. "But, Lucky, this is a huge change. I'll be moving away from my family -- my family in my world -- and I'm going to be in Neopia less, if at all, for a long time. Is that okay?" "Of course," Lucky said, her eyes watery. "As long as you're happy." "Thanks. I knew you'd understand!" her owner said. He hugged her and sat down to eat. "You've been crying," Dantus declared, as if Lucky didn't know. He was in Lucky's room, peering over her with his huge Grarrl head. "No, I haven't," she insisted. "All right, fine. But so what? It doesn't matter." "You're upset about Owner going away," Dantus accused. "Oh, don't start that. You think he's going to abandon us in the Pound or something. Well, I think so, too." "No, he won't! He won't!" Lucky ran out of the room, and out of the NeoHome, screaming. She sat on the back steps and cried again. After a few minutes, she heard the door open and then slam behind her, and Dantus sat down, his huge Grarrl body casting a shadow against the fading night sky and few sparkling stars. "Look, I'm sorry. We don't know for sure." But tears were still streaming down Lucky's face. They would not stop, so she wouldn't try to make them. She clutched her amulet -- it felt cold, lifeless. Just like she. It was nine long nights later when she finally knew. Her owner was picking up Dantus and she from a stay at the Neolodge and they rounded a corner onto a street that didn't lead to their NeoHome. They were heading toward the Pound. Lucky didn't care anymore. She let the Pound workers take her -- she didn't want anything to do with this human whom she had trusted and loved. Betrayed didn't cover the field of what she felt. 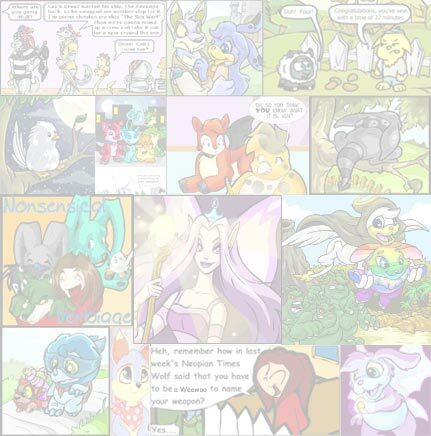 Neopets that were about to be abandoned were given one last chance -- they could look as pitiful and cute as they could and keep asking questions like "Are you sure you want to leave me?" and wail, "Please, no!" and, only if their owner refused to change his or her mind, were they finally dragged into cages. Dantus tried to beg his owner to keep him, but Lucky couldn't bear to even look at the human she called her owner. She felt numb as a worker lifted her into a cage and locked it. She was in an annoyingly white room; white walls, white ceiling, white floor, white lights, with a few scattered windows, and rows and rows of cages. She had lost all energy to cry. She sat there in thought, eventually realizing that her fate was better than some; she would never have to sit at a NeoHome or in a street, waiting endlessly for her owner. So she should feel lucky, but she didn't. The next morning, she saw Dantus taken out from the curse of the Pound. A kind newbie had adopted him. No such luck for Lucky, who started refusing food. After days, weeks, and what seemed like endless eternity passed, Lucky saw hope. A seasoned Neopian girl was looking for a new Neopet, she told the kind Uni in charge of adoptions. Lucky lifted up her head and watched hopefully, and her heart skipped a beat -- the Uni pointed at her cage. The Neopian girl ran to Lucky's cage -- and passed it. She eagerly flung open the cage next to hers, which contained a cute baby Meerca someone had dumped in the Pound, for some reason Lucky could not surmise. The girl paid the adoption fee and left, with Lucky feeling anything but her name. "Kinda makes ya feel lost, eh?" came a voice. It was a yellow Grundo, in the cage to the right of Lucky. "If my memory don't fail me, that Meerca was jus' brought in 'ere an hour ago." He paused. "My owner lef' me 'ere soon after he decided he didn't like the Grundo makeover. What's yer story?" "I don't want to talk about it," Lucky murmured. The next day, someone picked out the Grundo to adopt, and when the human went to pay the fee to adopt him, Lucky remembered her amulet. "Here," she said, thrusting her thin Zafara arm through the spaces between the bars in her cage and the Grundo's. "You're lucky, so take this. It's a good-luck charm. It didn't work on me." "I don't believe in luck," the Grundo said defiantly. "Well, give it to someone that does!" Lucky pleaded. The Grundo took it. "Thanks, kid." The Neopian who adopted him opened the cage, picked him up, and left. Lucky caught sight of the Grundo waving at her. The Neopian would be delighted to find that his new friend had an Amulet of Life equipped to him. She sighed, weak with hunger. Life was short, too short, but you couldn't think about that before your time; you just had to keep going. Finally, she knew it was time. 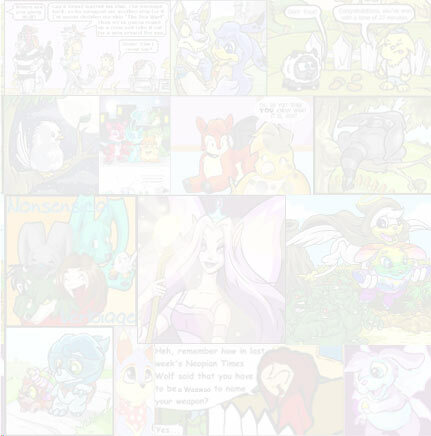 No Neopet suffered in the Pound forever, and Lucky had been there long enough. One simple "delete" command was all it took. She disappeared from Neopia -- all her feelings and memories were gone, erased. Although she ceased to exist, she still was as she always was -- unlucky. Some weather changes aren't for the best. "They have fliers!" 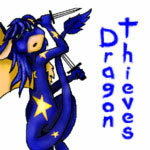 Corinth yelled pointing up into the night sky where winged Neopets were flying over the walls carrying weapons. "Here's a little something for you," Jhudora said as she handed the glowing choker to Beyaru. He snatched it greedily, an odd gleam in his eyes. Today's the day of the Pteri Flying Championships! You've been waiting for it, too, remember?" No. Not again. He was dreaming, and he knew it. The atmosphere of the city bus turned from average to spooky as each Neopet on the bus sported large, hideous scales.